Forrester Research released their latest version of the Forrester Wave Email Marketing Email Marketing Service Providers report Q3 2016. The report gives an overview of how participating email service providers in the Enterprise segment for B2C Marketers rank compared to each other. In May 2016 Forrester inspected the email marketing service providers through a product evaluation survey. They also interviewed 27 email marketers (customer references) and did an additional online survey of 63 email marketers to gain client feedback on their vendors and the market. The Forrester email marketing service providers report combines with a table with the wave scores, with the email marketing provider wave chart. The Forrester Wave scores the email marketing software providers based on current offering and strategy and then plots them in the Wave graph. The final ranking labels the vendors as either “Leaders,” “Strong performers”, “Contenders” or “Challengers”. This is a change from the earlier Wave reports that had the “Risky Bet” category, instead of “Challengers”. Well, there is no Challenger in this report, so everybody can be happy. You can see 2016 Wave graph in full size. If you want to see and download the full pdf report, it can be downloaded here, courtesy of Epsilon. (registration required). Forrester included 10 email marketing software solutions vendors in the report – looking at enterprise-level email marketing vendors. This time 10 Email Service Providers were included. (We list more than 400 email service providers, although not all Enterprise, of course). The chapter – “The Email Marketing Service Provider Landscape Explained” lists the selection criteria. Have a dedicated email marketing revenue stream and revenues of at least $60 million in 2015. The vendor must compete against other enterprise email service providers. For comparison, the criteria for inclusion the 2014 report asked for a 35% representation in Enterprise customers and did not have the requirement to compete against other enterprise email service providers. Zeta Interactive is no longer part of the evaluation, they were marked as “riskey bet” in the last report, which we noted was a raw deal because they had just released their new Zeta Hub to replace the reviewed email platform Zetamail 7.0. Which might be a totally understandable reason not to partake in this year’s report, we’ll go and ask them. 05-aug-2016 Update: Just one week after the Forrester Wave coming out, Zeta Interactive announces they bought Axciom Impact (Platform & services). The roughly 300 employees will be absorbed by Zeta. The deal is bundled with a data partnership and was just north of $50M. Adobe Campaign is assessed for the first time, at the end of 2013 Adobe seemingly to focus more on the email marketing market with announcing that they were letting go of their CPM model. Robert Brosnan from Forrester wrote a piece on it. 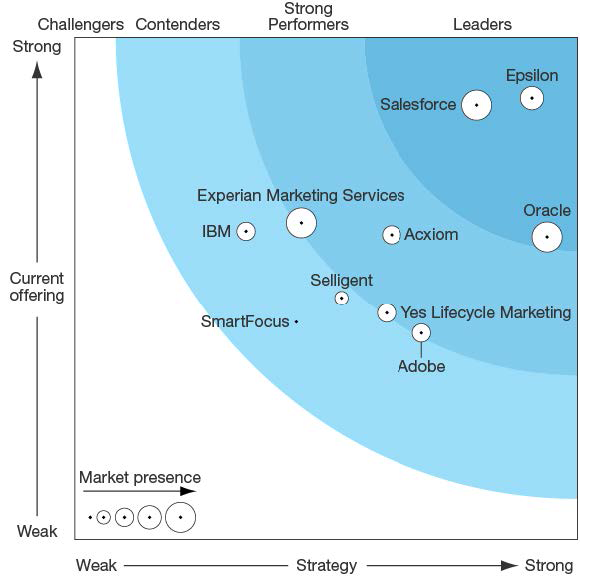 Being in several other Forrester Wave reports, it makes sense for Adobe to be in this one as well. SmartFocus Messaging Cloud is added to the set. StrongView, that was the Leading vendor on Strategy two years ago, is now a part of Selligent. Selligent Campaign is in the evaluation. MailChimp and Bluecore (smaller revenues) Although they must have misplaced a comma there. The revenue of MailChimp, is one of the biggest revenues in the industry with an estimated 20 Billion. Q2 2016 Email Marketing Services Customer Reference Survey. Another part of the report shows a survey filled in by the same (online) respondents. It talks about the expected investment in email marketing throughout 2016, the most important email marketing goals and what these marketers think is the most important part of the vendor offering. One can ask himself what is reported by asking the question “By the end of 2016, how will your email spending have changed across the following categories?” in Q2 of the same year. Especially once you think of budget cycles and the distribution of spending over any given year. The conclusion seems to be the significant increase in spendings is going mostly to email strategy and management. But there is also an increase for new email technology budget (64% sees a significant or slight increase) and Email Analytics (58% will up their spending). Update 29-08: Yes the Goals section was now correctly shown in the report. It shows a list of goals that the respondents rated from most important(1) to least important (5). From these numbers, we can conclude that email marketing for these enterprise companies is seen as primarily sales / retention channel. Taking that a bit further we can infer that it is delivering on that respect (otherwise, it could not be a sustainable goal). Cut communications costs has little priority at all, although this is a quite ambiguous description. Because what is meant with communications and cutting? The email marketing vendor report shows a stacked graph with applied email tactics, split up by duration: more than three years, one to three years and “don’t use but would like to”. The white part is the “dont use and dont want/plan to”. These are the tactics Forrester believes are innovative tactics that an email marketer could consider when selecting an Email Service Provider. The email practices of enterprise email marketers that have been employed the longest. With current adoption over 60%. Anticipated email marketing innovations are those that aren’t employed by enterprise email marketers yet, but they would like to. The category of in-email transactions was dropped from the list, while very much anticipated 2 years ago. Responsive design is currently used by 87% of the interviewed enterprise email marketers.